This species is accepted, and its native range is Mexico to Central America, Caribbean. Nativa en Colombia; Alt. 0 - 1800 m.; Andes, Orinoquia. Belize, Costa Rica, Dominican Republic, El Salvador, Guatemala, Haiti, Honduras, Jamaica, Leeward Is., Mexico Gulf, Mexico Northwest, Mexico Southeast, Mexico Southwest, Nicaragua, Panamá, Puerto Rico, Venezuelan Antilles, Windward Is. Zapoteca portoricensis subsp. flavida (Urb.) H.M.Hern. Zapoteca portoricensis subsp. pubicarpa H.M.Hern. Calliandra nicaraguensis Taub. & Loes. 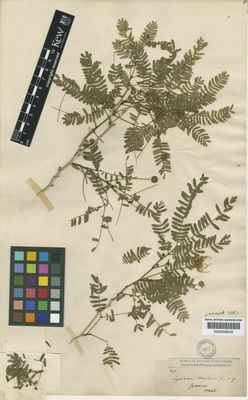 Calliandra vespertina (Macfad.) Benth. ex B.D.Jacks. Mimosa guineensis Schumach. & Thonn. Nielsen, I. C. (1992). Flora Malesiana, Series I Vol II Part I Mimosaceae.